So many revolutions throughout history have been chronicled by words, and words are inestimably powerful, yet what’s so striking about “Winter on Fire” is just how unremarkable the many after-the-fact on-camera interviews detailing the specifics of the 2014 Ukrainian Revolution play in context to the myriad of images captured by director Evgeny Afineevsky as the historic event played out. This is not to undervalue the people interviewed, honestly it’s not, but to denote the power of the footage itself. So often documentaries employ images to underscore what the talking heads are saying; here it’s the other way around. There is an incredible moment in the midst of a riot when one of the Berkut, Ukraine’s special police force, hammering at someone with his iron stick, pauses, raises his riot shield and looks directly at us, suddenly made to realize he’s being filmed, an unwitting testament to the camera’s awesome power. Though “Winter on Fire” proffers a whippet-quick prologue, detailing Ukraine’s troubled history with neighboring Russia, Ukrainian President Viktor Yanukovych’s pledge to join the European Union and then about-face to re-align with Russia, the considerable political context is hardly the film’s prevailing point. Instead it’s the crucial table-setter, like if a movie crammed all the events from 1764 to 1775 of the American Revolution into a thirty-second sound bite and then cut straight to the Lexington green. The specifics of what it means for Ukraine to join EU are never really addressed, and like how much to so much of America the concerns of England remain inconsequential to that story of our nation’s birth, so do the governmental players remain principally off stage. 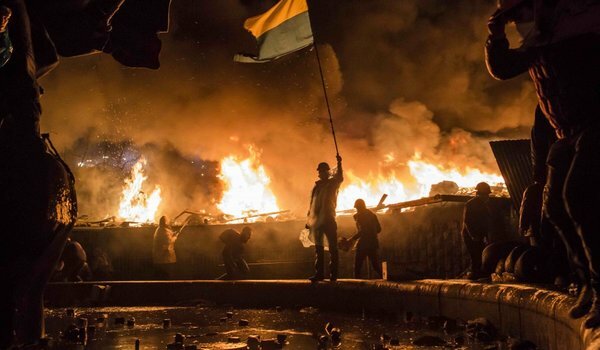 President Yanukovych is seen through TV screens and the Ukranian Parliament is never heard from, while the Berkut are essentially faceless brutes, beating and killing at will. One interview is provided with an ex-army member in the wake of the revolution but even he is a conspicuously a sympathizer to the everyday rebels. This is not intended as a criticism. “Winter on Fire” makes no pretense about being even-handed. It is firmly on the side of the uprising. It is high voltage advocacy filmmaking, first, second, third, fourth, and fifth. It believes in the will of the people, and it spotlights the will of the people by spotlighting no individuals. Yes, certain people are interviewed, and several famous Ukranians are name-checked as they speak to the masses, but no one revolutionary is placed above any of the others. They are all at the same level, fighting the good fight. As such, “Winter on Fire” effectively documents what a rebellion can do, how a group of unified people can come together and instigate change simply from the unshakable foundation of their belief, and how that belief can manifest itself in almost improbably physical determination not to be stopped. By the end, Afineevsky captures how the Berkut as walls of shielded human roadblocks gradually gives way and they instead become desperate individuals hiding and picking people off. Their numbers dwindle in the face of so many, bending to the power of the repressed. Afineevsky is uninterested in examining the long-term consequences of what the rebellion has wrought; he is interested exclusively in the immediacy of the moment, the way in which it sweeps you up and carries you forward. This is revolution in real time.